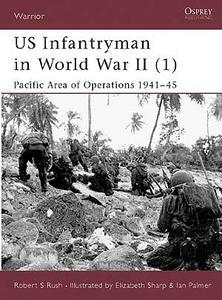 This title deals with the experiences of the American soldiers who fought the Japanese across the Pacific islands, and the specific nature of this combat environment. It follows a hypothetical soldier, ‘Michael’, through his enlistment into and training with the 165th Infantry Regiment (New York National Guard). It takes him through the 1941 maneuvers the 27th Infantry Division participated in, the transfer to Oahu, and into the reality of daily life and combat in the Pacific theater from 1942 to 1945, including Makin, Saipan and Okinawa. It also looks at the PTO administrative procedures for replacements, and medical and psychiatric care of the ordinary soldier. Whilst the focus is on one individual, the experiences of the many are examined and woven into an intricate and meticulous narrative.